Salami Coker was born on 22nd November 1945. He was executed with Bambay Kamara, Yayah Kanu, and others on 29th December, 1992, in Freetown, Sierra Leone. Salami's role as one of the early international actors was a great pride to Sierra Leoneans and Africans in the diaspora. He attended the East 15 Acting School, now affiliated with the British University of Essex. "Several generations of brilliant young actors and actresses have come out of this conservatoire," said Mike Leigh, film and theater director. "The contribution of East 15 actors to the British theater, television, and film over the past decades has been immense." A little over a month since the elections we've had a lot of academic analysis on why the SLPP [Sierra Leone Peoples Party] lost. Very impressive displays of our best intellect. However, I’ve learnt that people rarely make decisions based on intelligence and logic; emotion has a lot to play when choosing a leader. SLPP lost simply because they failed to listen to the people. Taking the voters for granted after being in power for a while is a political disease so easy to catch and SLPP is no exception. After Kabbah’s successes, especially ending the war, they failed to recognise that people were disappointed with his second term. To the ordinary man the war was over but there was no progress. Simple. They failed to listen that people didn’t want the shadow of military coups in our future and that Maada Bio would be a hard sell. Today, before the esteemed representatives of the people, I once again, with faith in God, loyalty to the constitution, and firm commitment to the achievement of our national aspirations, accept the honour bestowed upon me by the people of this country to serve them as President for the second and last term. I glorify God Almighty for making this happen. I thank every citizen of this nation for the confidence reposed in me and my party, the All Peoples Congress to take the country to another level. His Excellency Dr Ernest Bai Koroma has received the leadership of the Sierra Leone's People Party (SLPP) in audience at State House, Freetown. His brief welcome address, the newly re-elected Fountain of Honour and indomitable Father of the Nation said that he is welcoming the SLPP in his capacity as President of Sierra Leone after the successful conclusion of the November polls. President Koroma also said that the recently concluded elections were acclaimed by both national and international observers as free, fair, peaceful and largely credible. He called on the SLPP to have faith that any political issue in the country falls under his purview as President of the Republic, adding that he believes the SLPP should address their concerns through the right channels. The elections are over in Sierra Leone and President Ernest Bai Koroma has been re-elected for a second term. Below are excerpts from an interview that BBC Media Action did with former vice president Solomon Berewa earlier this week in the nation's capital, Freetown. Claudia Anthony started by asking Mr. Berewa what he made of the election results, what they reveal about the nation of more than six million people, and the way forward. Solomon Berewa: It is not a good model. We don't want this sharp division reflected in these elections. The whole of the North went APC [All People's Congress]; the Southeast–excluding Kono–went SLPP [Sierra Leone People's Party]. We don't want that situation to be a model which Sierra Leone should follow. We want the political landscape to be integrated—SLPP winning in the North, APC winning (seats) in the South. Let us have a national parliament, a national government. That is what we want. Sierra Leone Gender Watch (SLGW) strongly condemns the detention of the six women suspected of alleged election malpractice, who have been held past the 72 hours constitutional time limit prescribed in section 17(3) of the 1991 Constitution. The Constitution provides that should the Sierra Leone Police have sufficient evidence to charge their matters to court, these women should be bought to relevant authority within the specified time limit. Every year 16 Days of Activism against Gender Violence runs from 25 November to 10 December. The global campaign spans the International Day for the Elimination of Violence against Women on 25 November and International Human Rights Day on 10 De-cember. The period also includes Universal Children’s Day and World AIDS Day. Every president who gets elected into office in a maximum two-term electoral system is concerned with two things. First, to get re-elected, and then his legacy. 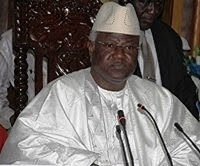 Koroma's first term government composition clearly reflected his re-election agenda. Majority of his cabinet and key government positions were filled from the party base (predominantly from the North). Then there was the People's Movement for Democratic Change (PMDC) factor. Under the circumstances of his first election, Koroma appointed some PMDC party members to a few government ministries either as ministers or deputy ministers as a payback for PMDC leader Charles Margai's endorsement, which ultimately handed him the presidency. And then, there was the strategic re-election move to penetrate into the south-east where his party had performed so badly in 2007. To infiltrate Kenema and some parts of the east, Koroma surprisingly made JB Dauda the foreign minister-which turned out to prove quite ineffective. 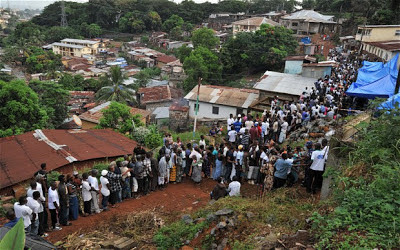 Sierra Leone's National Electoral Commission (NEC) announced Friday, November 23 results of the nation's Presidential Elections held last Saturday. According to the NEC, 1,314,881 votes were cast in favor of the candidate Ernest Bai Koroma and he received 58.7 percent of valid votes cast in the election. 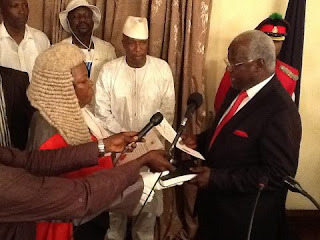 In the photo, Ernest Bai Koroma reads the oath of office as the President of the Republic of Sierra Leone as he is sworn in for a second term by Chief Justice Umu Hawa Tejan-Jalloh. Read the speech President Ernest Koroma gave after the swearing-in ceremony held today in the nation's capital, Freetown.